Larry the Dancing King is about a twelve year old stick insect called Larry . 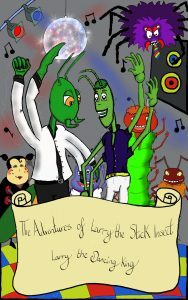 The book follows Larry and his group of friends on their adventures as they attend their school end of year dance. It starts by introducing Larry to the reader before joining him as he gets home from school and gets ready for the big event, all the time trying to pluck up the courage to ask a girl to dance. Miranda is a quiet, shy and pretty Ladybird who Larry is in love with. Miranda doesn’t know it and although he is incredibly nervous, Larry gets dressed up in his best gear and aims to try and impress the girl of his dreams whilst strutting his stuff. But there’s a problem, Marv, a Praying Mantis who picks on everybody and acts like he owns the school. Marv, along with his sidekicks, bullies Larry and his friends Gareth and Simon relentlessly. He also fancies Miranda but treats her and her friends badly, much to Larry’s displeasure. Whilst at the dance and after having a small accident involving a teacher, a dress and a spilt drink Larry is confronted by Marv and his sidekicks in front of the entire school. Larry and his friends do their best to get out of the situation but ultimately there’s no escape and Larry is forced to come up with something in an attempt to stop them all from being beaten up. Unbeknown to any of his friends Larry has a secret, a secret that nobody knows which might, just might, save the day. Larry reveals his secret in spectacular fashion, much to the astonishment of everybody present. The book is funny, action packed and paints a vivid picture of the story whilst having a good moral at its core. Larry and his friends have been well received by children and adults alike. The book is aimed at kids (and big kids) aged 7+. It is available in Kindle and audio book formats. The audio book version is narrated by the immensely talented Jonathan Keeble.